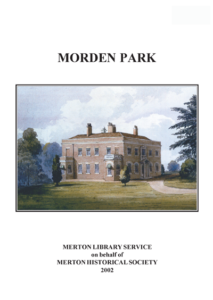 The following titles have been published on our behalf by Merton Library Service, and these are available at local libraries and at Merton Heritage & Local Studies Centre at The Civic Centre, Morden. 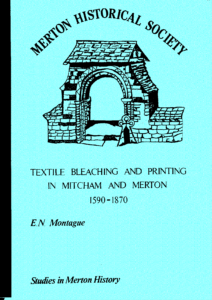 This detailed study traces the history of the four major areas of textile bleaching and printing along the banks of the River Wandle within the ancient parishes of Mitcham and Merton – Willow Lane, Ravensbury, Phipps Bridge and Merton Abbey. This volume has long been out of print, though copies can be consulted at Merton Heritage & Local Studies Centre. 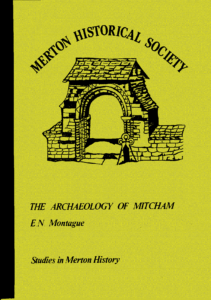 However, the author has updated the information relating to the three Mitcham sites and has included this in the relevant volumes of Mitcham Histories. This study brings together what is known of the archaeology of the area from earliest times until the end of the Dark Ages. The Anglo-Saxon cemetery at Mitcham is well-known, but the prehistoric and Roman discoveries are also worthy of mention. This study was published by Merton Library Service on behalf of Merton Historical Society and is now out of print. Copies may be consulted at Merton Heritage & Local Studies Centre on the 2nd floor of Morden Library.